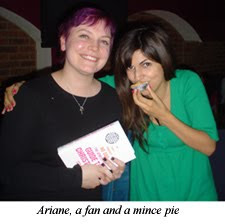 “Not since Sandra Bullock in ‘Speed’ has a woman utlised a bus with such skill” said Rebecca Watson, introducing Ariane Sherine to a fully packed Skeptics in the Pub last night. Sherine is presently doing The-Big-Book-Tour with ‘The Atheist’s Guide to Christmas’ and appears to be covering more ground than Santa in a month of Christmases, so catch her if you can. Her talk about the conception and growth of the ‘Atheist Bus Campaign’ is extremely funny and I, for one am always delighted by the incongruity of appalling language from such a diminutive and affable person. The campaign famously started with no more than a whimsical thought in Sherine’s Guardian column, was picked up enthusiastically in the comments section and launched in a small kind of a way after that. The publicity wasn’t grand and the total raised wasn’t huge. It wasn’t ‘til the Telegraph headline ‘Atheists fail to cough up for London Bus Ad’ that a large herd of heathen cats were motivated to try herding and some synchronised sponsoring, all to massive effect. “I’ll burn in hell for being gay anyway, so what’s £10”, wrote one donor. The book is a follow-up project edited by Sherine. It has the old favourite science contributors such as Simon Singh, Richard Dawkins, Ben Goldacre and an impressive bunch of media types such as Ed Byrne, Mitch Benn, Lucy Porter and David Baddiel. In total, they number forty-two, to accord with the Cabbalistic Constant from The-Good-Book (‘Hitchhikers Guide’ … surely I didn’t need to say that?) The writers’ profits are going to the Terrence Higgins Trust to somewhat counterbalance that the Pope thinks condoms cause AIDS. “Being told that god doesn’t exist may make a chap think twice before blowing himself up on the top deck”.